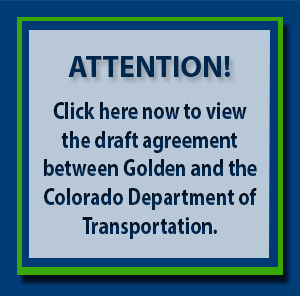 On May 9, Golden City Council approved a draft agreement with the Colorado Department of Transportation (CDOT) that creates a roadmap for transportation projects within our city over the coming years and decades. The council approved the plan with a vote of 6 to 1 after a nearly 3-hour public hearing. Citizens filled the council chambers and much of an overflow room in the fire station, where they watched the proceeding on TVs. The city also received several dozen emails on the topic before the hearing. At an open house that preceded the hearing, citizens perused maps detailing the plan. None of this would have been possible without the hard work of Dan Hartman working with CDOT engineers, and Mayor Marjorie Sloan’s tireless efforts to reach out to our neighbors. Both Hartman and Mayor Sloan praised CDOT officials for their cooperation and willingness to negotiate an agreement that recognizes the importance of protecting Golden. Hartman said CDOT and Golden still face the “monumental challenge” of identifying funding for the specific improvements outlined but that process can begin with the council’s endorsement of the plan. The first priority would be building an interchange at 19th Street and U.S. 6, which has high volumes of vehicle, pedestrian and bicycle traffic, and the city’s highest accident rate. Council also approved with a 6 to 1 vote, funding of up to $150,000 for preliminary design of potential transportation projects along the corridor. The story of how we got to this point follows a long and winding road that’s worth revisiting to provide context and perspective. Pressure to complete a beltway around the metro area has been mounting for decades. There have been many efforts to complete a section through the Northwest part of the region; all have assumed that the road would follow the 6th Avenue and SH 93 corridor through Golden. That would make Golden the only established community that would be bisected by the beltway anywhere in the metro area. In 1989, area voters defeated a ballot issue to fund construction of the proposed W-470 toll road with a new $10 vehicle registration fee. But that did not deter beltway proponents. The Northwest Parkway Highway Authority was created in 2001, and completed its segment of the highway from I-25 at E-470 to US 36 in Broomfield. At the same time Jefferson County, Golden, Arvada, Lakewood, Westminster and Wheat Ridge hired infrastructure consulting firm CH2MHill to do a transportation study of the northwest quadrant of the metro area. That study concluded that there would be little traffic benefit from completion of the beltway through Jefferson County and that transportation needs would be better addressed through improvements to existing roads in the region – namely a parkway along 6 and 93 and similar improvements on Indiana and McIntyre. Golden citizens and city leaders came together in 2003 to outline a vision for improving transportation within Golden city limits, responding to the needs defined in the CH2MHill study. The result of a year of study and extensive community discussions, including nine public meetings and hundreds of citizen comments, found that traffic needs could be met through a specific set of upgrades or realignments of existing roads (including 6 and 93). This Golden plan, which would also keep traffic noise within reasonable levels while connecting neighborhoods and preserving the natural and historic beauty of the area, was unanimously adopted by City Council. Jefferson County and Arvada responded by forming a highway authority to build the Jefferson Parkway toll road from Broomfield to SH 93 north of Golden. This effort was supported with a $15 million environmental study by CDOT that showed a 70-mph six-lane freeway all the way through Golden along 6 and 93. This process ignored the plan that Golden had defined in 2003 and prompted strong disagreement between Golden and CDOT. There was an effort in 2011 by Golden, CDOT and other local governments to find a compromise but that fell short. However, the current CDOT leadership appointed by Gov. John Hickenlooper expressed a renewed commitment to find a real solution. Golden last year held another community-wide transportation conversation with residents to evaluate possible 6 and 93 corridor designs that would be consistent with residents’ vision for our small town. Based on that feedback, City Council directed Golden staff to work with CDOT for the past year to identify potential improvements for the 6 and 93 corridor in Golden that work for our community. This was part of a deliberate strategy to have the political folks step back and let technical staff see if there was a compromise that might satisfy Golden, CDOT, and benefit the entire region. Please head to our Golden’s Proposed Plan page to review the changes to the original 2003 Golden Plan. Golden’s one-of-a-kind setting provides unique benefits and challenges. The city’s small-town feel is guarded from urban sprawl by mesas to the north and south and mountains to the west. Major roadways that connect us to the region make transportation convenient but also channel regional growth pressures into our narrow valley. Managing these dynamics is key to maintaining the quality of life upon which Golden residents and businesses depend. In 2003, Golden citizens and City leaders came together to outline a vision for the future of transportation within the City. The City has been working intensively to update this plan to ensure that it represents both Golden’s continuing vision for thoughtful transportation planning and how the region and its needs have evolved. Energetic citizen engagement is the foundation of good public policy. This website will help Golden residents stay informed and share their views on transportation-related issues. Here, Golden residents and businesses can ask questions, make comments, and learn about both the history of, and latest developments regarding, this issue. Please explore the site and sign up for email updates so we can share important news with you. 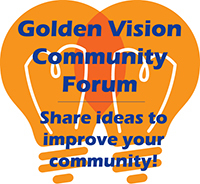 This site was created in early 2011, when Golden was in talks with neighboring jurisdictions on issues related to the proposed Jefferson Parkway. Golden’s goal was to mitigate potential negative impacts of the Jefferson Parkway while identifying funding for needed transportation improvements within the city. Those negotiations ended in late 2011 without an agreement. Since then, however, Golden has continued informal discussions with state and regional officials on transportation issues. Because of the extended and evolving nature of this issue, some of the information on this site serves as a historical record and may not reflect the latest developments.